In the wake of Hurricane Sandy and the cold winds blowing our way, I’m sure we’d all love to be relaxing on a beach in Hawaii, with the gentle breeze on our faces. I, for one, want to trade my cans of Progresso Tomato soup and Naked Juice smoothies for some Hawaiian Spam Musubi and an Acai Berry Bowl. There is no reason to fret though, even when the rest ofBoston University doesn’t feel like paradise, your kitchen can! I’m lucky to have a roommate from Hawaii who introduced me to some of the most delectable treats from the aloha state. One of the things I miss most about the summer is the variety of fruit treats. The dining hall probably won’t be serving strawberries or raspberries, but it will always have apples. Just when I was getting bored of having one red delicious a day, my roommate pulled out a small bag of a mauve colored powder from the pantry. This Li-Hing Powder is ground up plum skin that has been pickled in sugar, salt, food coloring and other sweeteners. In Hawaii, the powder is traditionally sprinkled on apples and pineapples, but people also try it on gummy candies, shaved ice and popcorn. Li-Hing has a unique tart taste that is both salty and sweet, giving the apple a good kick without overpowering its own fruity goodness. 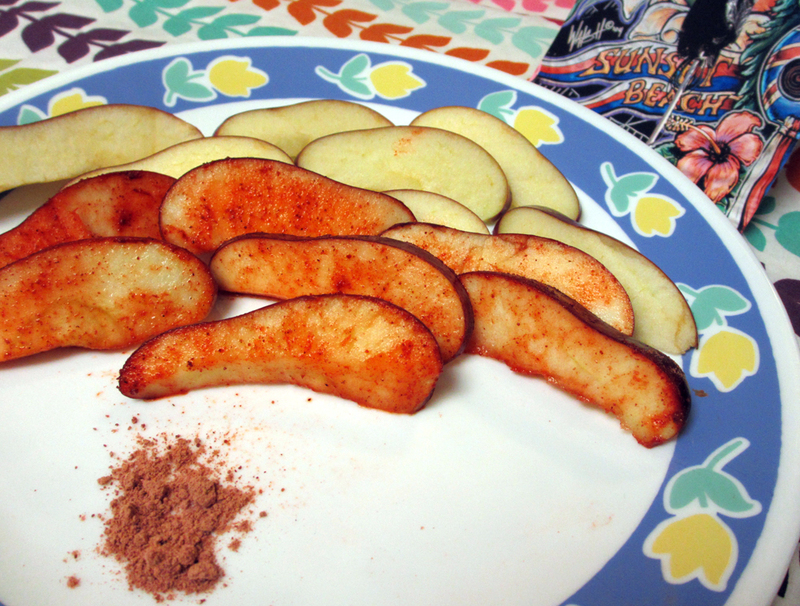 I mixed together a sliced red delicious apple and two teaspoons of Li-Hing Powder in a bowl to perfectly coat each slice. The result was a unique and healthy treat that was also beautiful to look at. Li-Hing can be found at Super 88 for all those interested in trying some out! Although fruit can be powdered to perfection, I still long for fresh fruit and yogurt smoothies from my own blender at home. One day when I was reaching for a bag of frozen strawberries at Shaws, my roommate advised that I buy an acai frozen pouch instead. In Hawaii, she often eats antioxidant-rich acai bowls for breakfast: a delicious midpoint between a smoothie and a parfait. Acai berries are known as a super-food for their possible weight loss and anti-aging benefits. The berries are originally from South and Central America, but became popular in Hawaii for their super-food status. The recipe below takes other yummy and healthy ingredients, such as blueberries and bananas. Acai Banana Bowl (adapted from Epicurean Mom) Makes 2-3 servings.Active and Total Time: 10 minutes. Combine acai, banana, strawberries and apple juice. Blend until smooth. Spoon into serving bowl garnish with bananas, blueberries, coconut, granola and goji berries; repeat with remaining bowls. Once you’ve filled up your fruit quota--although I’m not sure that’s ever possible--you should head to the nearest 7/11 and buy yourself a can of Spam. Yes, Spam. When my roommate told me that this processed and often mocked can of meat would bring me closer to Hawaii, I was shocked. But she said that on the mainland, we’ve been eating Spam the wrong way all along. Spam should be eaten pan fried and soaked in soy sauce, coated in rice and wrapped in dried seaweed. It should be eaten as sushi, in a uniquely Hawaiian dish called Spam Musubi. Spam Musubi is a comforting snack food to most Hawaiians--something more filling than a bag of chips but not overwhelmingly hearty. It is savoury and easy to eat since it is the same size as a KFC Snacker. Unlike the KFC Snacker, however, Spam Musubi tastes exotic enough to wake up the palate and familiar enough to become your new favorite after school snack. Spam Musubi (adapted from Momofuku) Makes 8 servings. Active and Total Time: 20 minutes. Open can of Spam and turn it on it’s side to slice into 8 equal pieces. Heat up a non-stick frying pan on medium-high heat and add slices of Spam, cooking and turning until desired level of crispiness. Add the sweet soy sauce to the pan and lower heat. Make sure each piece of Spam is coated with soy sauce. The soy sauce will bubble and coat each piece of Spam with a sticky, salty, sweet goo. Transfer Spam to a plate. Place one half-sheet of nori down on a cutting board, shiny side down; and put the Spam can (or musubi maker) in the middle of the sheet. Scoop a generous amount of rice into the mold and pack it down--you want the rice to be compressed. Add a slice of Spam and another layer of rice, making sure to pack it down as you go. Use a spoon (or a musubi handle) to press down on the rice and using your other hand pull the mold up and release the musubi. Wrap the nori around the rice and seal the edges with a bit of water. If reading this article made you a feel a bit calmer, a bit sunnier, and bit more in the Hawaiian state of mind, you can only imagine what eating these delicacies would do! Get yourself to a supermarket and bring yourself home a taste of paradise!